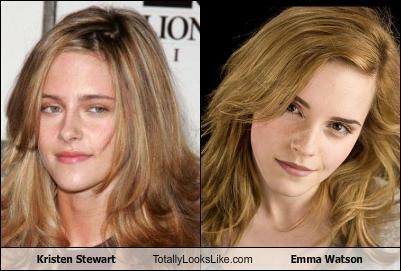 Kristen Stewart looks totally like.....Emma Watson?!. O_O. Wallpaper and background images in the 哈利·波特与暮光之城 club tagged: series twilight harry potter emma watson kristen stewart funny totally looks like. This 哈利·波特与暮光之城 photo contains 肖像, 爆头, 特写镜头, 特写, 爆头特写, 吸引力, 感染力, 辣味, 热情, and 上诉火辣.